Greetings from The 88 Project! We are bringing you news, analysis, and actions regarding human rights and civil society in Vietnam during the week of August 13-18. A court in Nghe An province sentenced political activist Le Dinh Luong to 20 years in prison on August 16, one of the longest sentences in recent years. Another political activist, Nguyen Trung Truc, was supposed to face trial on August 17, but it was postponed. The founder of the Vietnam Republic Party, Nguyen Viet Dung, received a one-year reduction of his sentence on appeal this week, but he did not have a lawyer at the appeal trial. Authorities have also announced that citizen journalist Do Cong Duong’s trial is set for September 10. In prison, migrant labor rights activist Tran Thi Nga is receiving death threats and is subject to beatings. US citizen Michael Nguyen also remains detained with no official charges. This week, read our last translation of a series of letters from Tran Huynh Duy Thuc, a well-known figure in the Vietnamese democracy movement, who writes from prison on current events and his desire to stay in Vietnam. Thuc has also been on a hunger strike since August 14 to protest against the authorities forcing him to admit guilt. We remember several political prisoners this week: Nguyen Nam Phong, who was arrested for trying to protect environmental activist Hoang Duc Binh; Catholic prisoner Ho Duc Hoa; and pastor A Dao and many other ethnic minority prisoners. Several activists and communities are at-risk this week, including writer Pham Doan Trang, who was severely beaten after attending a music show, female blogger Huynh Thuc Vy, and Buddhist Youth Movement members. In the news, read an interview with Will Nguyen, who was detained after protesting in Vietnam and later deported, and a piece on the Catholic community’s role in the Vietnam activist movement. Please consider donating to the Doan Ket Fund, from the NOW! Campaign, to support political prisoners, activists at risk, and their families. Political activist Le Dinh Luong was tried on August 16 in Nghe An province and sentenced to an astounding 20 years in prison. A veteran, Luong was sentenced under charges of subversion for peacefully advocating for a clean environment and multi-party democracy. Luong’s lawyer, Ha Huy Son, says Luong will appeal the verdict. After the trial, the US State Department said it was “deeply concerned,” and urged Vietnam to bring its laws into line with international human rights obligations. Amnesty International had expressed worries prior to the hearing that Luong would not receive a fair trial. Brotherhood for Democracy member Nguyen Trung Truc‘s trial has been postponed. The reason is unknown and no new date has been set; it was originally set for August 17. It is not clear if Truc will be able to meet with his lawyer prior to trial. Truc is having problems with his eyesight and is generally in poor health. He is a human rights activist and has assisted victims of the Formosa environmental disaster. 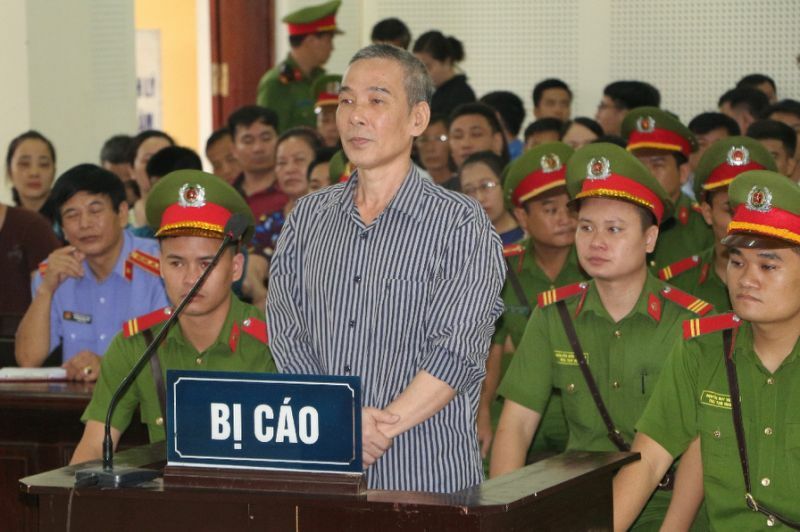 Political prisoner Nguyen Viet Dung will still have to serve six years in prison, as authorities only reduced his sentence by one-year during his appeal trial on August 15 in Nghe An. There was no lawyer present to defend him; the public and defense were given very little advanced notice of the trial date. Nguyen Viet Dung has assisted Formosa-affected fishermen and is the founder of the unsanctioned Vietnam Republican Party. Land rights activist and citizen journalist Do Cong Duong will go to trial on September 10 on charges of “disturbing public order” under Article 318 of the 2015 Criminal Code. He faces up to seven years in prison. He also faces separate charges of “abusing democratic freedoms,” for which he will be tried at a different time. Duong was arrested in January 2018 after filming a forced eviction. Imprisoned land and labor rights activist Tran Thi Nga is facing unsafe conditions in prison. Her cellmate has been physically attacking her and making death threats. The prison has not responded to her concerns, and Nga thinks they have placed this cellmate with her in an attempt to get her to confess to alleged crimes. Nga, an advocate for migrant labor standards reform, was sentenced to nine years in prison in July 2017. US citizen Michael Nguyen is still being detained in Vietnam. His family has not been able to speak with him. Several US lawmakers are organizing efforts to press for his release. Mr. Nguyen still has not been officially charged and could be held for several months without charges. Imprisoned writer and entrepreneur Tran Huynh Duy Thuc has been on a hunger strike since August 14. The reason for the hunger strike is that the authorities have been pressing him to admit guilt in order to receive clemency, which Thuc refuses to do. Thuc wants to use Vietnamese law itself to advocate for his release, citing new legal provisions from the 2015 Criminal Code that should exempt him from having to serve the remainder of his sentence. The authorities seem to be ignoring his appeal to use the law, and are opting to use of common tactic of forced admission of guilt as the basis for early release, instead. Thuc, a prolific writer, has written a series of letters home to his family about prison life and his thoughts on current events. In the third and last letter, from June 2018, which we translated and published on our website, Thuc writes: “Whether as a civilian or a prisoner, I always try my best to do everything I can to help the nation fulfills its historical mission. This has been my ultimate goal for many years.” The Vietnamese government has chosen to imprison someone like Thuc who merely wants to promote peace, democracy, and prosperity for his country. We hope these letters will help you understand more about who he is as an individual, a thinker, and a visionary. Click here to read the firstand second letters in the series. This week, we remembered Nguyen Nam Phong’s birthday on August 15. He was arrested in late 2017 after driving a car for a Catholic priest and environmental activist Hoang Duc Binh in May 2017. He refused to open the door for police during Binh’s arrest and was later sentenced to two years in prison. We also remembered Catholic social activist Ho Duc Hoa, who was arrested in August 2011 and later sentenced to 13 years in prison. He is one of 14 activists from around Vinh City in Nghệ An province who were arrested between August and December 2011. August also marks the arrest anniversaries of at least 13 ethnic minority political prisoners. Many are religious freedom advocates, and many are also serving 10+ year prison terms. For example, August 18 marked two years since A Dao, pastor of the Montagnard Evangelical Church of Christ, was arrested; he was sentenced to five years in prison. Read about his and others’ peaceful activism in our Vietnam Political Prisoner Database. Female blogger and co-founder of Vietnamese Women for Human Rights, Huynh Thuc Vy, was detained for 15 hours last week. Authorities placed her under investigation for allegedly defacing the Vietnamese flag, and she is banned from travel until the investigation period is over in October. Vy has long been an advocate for women’s rights and minority rights in Vietnam; she has clear views on the reasons for spray-painting the Vietnamese flag, which, for her, is just a peaceful expression of her dissent, and thus, protected under international law of human rights. Read our translation of a post on her Facebook, in which she elaborates on the intent of her action, as well as her analysis of what the government is really trying to do in restricting her freedom of movement for the next two months: preventing her from participating in and gathering people for potential protests. Several Southeast Asian human rights groups have signed a letter calling on Vietnam to end the investigation into her. Authorities have harassed children attempting to attend a Buddhist Youth Movement summer camp in Hue. Police threatened parents and children to prevent their participation in the camp and prohibited children from arriving by interfering with buses. Eventually, some children were able to arrive via different routes or help from the community, but the concerted disruption highlights the continued repression of religious communities despite the passage of the Law on Belief and Religion. In light of recent detentions of peaceful protesters and activists in Vietnam, consider contributing to the Doan Ket Fund, a fund established by the NOW! Campaign to support political prisoners in Vietnam. “Doan Ket” is Vietnamese for “solidarity.” All donations go directly and entirely to political prisoners and their families or to individuals identified by the NOW! Campaign as at risk of arrest, detention, and imprisonment.